Everyone in Moorvale believes the legend: The brave knight Tristan and the famed wizard Vithric, in an epic battle decades ago, had defeated the evil Nethergrim and his minions. To this day, songs are sung and festivals held in the heroes' honor. Yet now something dark has crept over the village. First animals disappear, their only remains a pile of bones licked clean. Then something worse: children disappear. The whispers begin quietly yet soon turn into a shout: The Nethergrim has returned! Edmund’s brother is one of the missing, and Edmund knows he must do something to save his life. But what? Though a student of magic, he struggles to cast even the simplest spell. Still, he and his friends swallow their fear and set out to battle an ancient evil whose powers none of them can imagine. They will need to come together--and work apart--in ways that will test every ounce of resolve. In a story reminiscent of the Ranger’s Apprentice epic and the Chronicles of Narnia, Matthew Jobin weaves reality, magic, and adventure into the next great fantasy phenomenon. 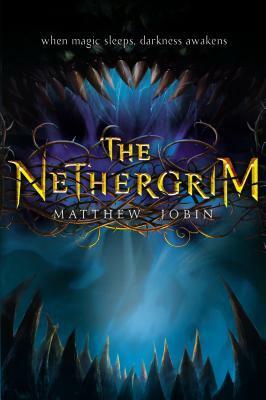 The Nethergrim is an enjoyable middle-grade fantasy by first time author Matthew Jobin. It tells of the adventure of three outsiders: Edmund, the son of an innkeeper, who spends what little money he saves on books of spells, legends, and histories; Katherine, the daughter and only child of the Lord’s master of horses, who should be learning how to be a lady but instead is riding horses and wielding swords; and Tom, an orphan slave, who serves as shepherd to an abusive farmer. They live in Moorvale, a village akin to one you might find in the medieval times. It’s all very primeval and gothic. Mysterious things have been happening: lost animals, missing children, and whispers of an old terrifying tale more suppressed than forgotten. You see, the town of Moorvale owes its existence to three heroes: Tristan, the greatest knight that ever lived; Vithric, the greatest wizard that ever breathed; and John Marshal, a simple townsman. It is said they defeated the Nethergrim some decades ago that allowed the survival of the sleepy town. But perhaps they did not. And so begins a journey for the three young friends; a journey of magic and good and evil, but also of self discovery and of growing up. What I really liked about Jobin’s protagonists is that they questioned life in a way that was very meditative. Edmund, at some point, says he is tired of “waiting for life to hurt [him]”. I mean, ow. All three are considered outsiders in their town, all three are living in circumstances they wish they could change. They want to run away and dream of better lives, but then they consider their prospects, their duties to their families, their roles and rank in life…what are the possibilities for them and what are not. The fantasy elements here are quite stock, though there is an impressive cast of terrifying creatures, like the bolgugs, a monster that resembles a man were it not for the blue skin, yellow eyes, and razor-sharp teeth. There are also grotesque uses of magic, like the eating of children and sucking away their life leaving them human-sized prunes. And…weird a comparison as this might be…but there was a bit of the “evil talking in your head to bend your logic” kind of thing a la the Sinsar Dubh in Karen Moning’s Fever series. I think readers have had a hard time categorizing this either as middle grade or young adult, which is quite understandable as the overall context of the story is quite young but incorporated with disturbing and proper shudder-inducing scenes. What I will say is that this is a wonderful, mature writer writing for a very young audience. I think Jobin has real talent. This is the kind of writing that makes me anticipate a writer’s next work. This is his debut novel, and though I didn’t absolutely love it, I can feel that he has so much more to give. The promise is there. But for now, this is a very good beginning to a fantastic series that I can imagine children who’ve grown up with all of our classic fantasy stories thoroughly enjoying. An advance copy was provided by Penguin Canada for this review. I do so love books about magic and horrible villains and legends and such. This looks quite delightful. I have not heard of this book at all but it sounds like something I want to read. I really like darker, gothic tales and this sounds intriguing. Reminds me of the scarier, traditional fairy tales. Thanks for the review. Adding this one to my TBR stack. Another fantastic review for this book, and now I am trying to decide on buying this one ASAP or letting it slide for a while. It makes my heart sing to see a MG book get some major coverage. That genre seems to get so little love in the blogging world. This sounds like a very good book! Awesome review! I been looking forward to this one, sounds a little disappointing. But I think I shall give it a shot anyway. The writing looks impressive. Magic? Good & Evil? Journey? Count me sold!! I absolutely love fantasy books with a touch of magic! And that quote sounds awesome! I will definitely keep an eye on this book and the author :D He has a lot of potential. Mel@thedailyprophecy recently posted…Early Review 249. Julie Kagawa – The forever song. Aw, I’m glad you’re so excited Mel.I hope the book nor the characters disappoint! This does sound like a good start to a new series. I actually like that, even though this is a MG, the author doesn’t shy away from the “shudder-inducing” scenes, which would thrill an older MG reader (even some of the youngers…). I definitely see kids liking this and I saw on Goodreads that it’s been getting quite good reviews. Actually, some of them like it more than I have — BUT I do believe that it’s got promise :) I also think this might be one of those series where the characters grow up, which would be nice. Thanks, Jessica. There are some nice, new and interesting things here that I hadn’t come across before. Like the way magic worked and of course, some of the creatures. I think it’s always good to wait until a series is done before starting — that’s if you can hold out, haha! Omg, Carina, I read a lot at night since that’s my down time and it didn’t cross my mind that this might actually creep me out a bit but I actually had to put it down at some point and continue the next day when it was nice and sunny :) But I do get scared easily…so maybe it’s just me. Yes, Danielle! This wasn’t a four star book to me but I can see some real good writing that I’d like to read again perhaps in different context. He had some really beautiful descriptions and phrases…very poetic, even. I’d like to read him in YA or adult. Fingers crossed. It sounds and looks middle grade to me, Melliane :/ Have you read it or plan to? no for now no, I didn’t know this one. Well, for me, I actually think a lot more could have been fleshed out. It was a good read, but very fast paced and I’m not sure how much of that is due to it being a middle grade. I think kids, however, will like this. I also love fantasy…I’m branching out a little more in adult fantasy mostly because a lot of fantasy YA tend to be very similar. Glad to see you enjoyed this one, I have it on my TBR list too. I do so love my MG fantasy and the bonus of medieval times has me more intrigued. Great review. Thanks, Brenda. I don’t read too much MG but I’ve been impressed by a fair few. This wasn’t one of the best ones I’ve come across but still enjoyable. It’s weird but I’m a little more excited to see what Jobin can come up with in YA or even adult. I’m quite intrigued about this book now, and I feel that I am going to add it to the TBR list and also gift it to the bf’s niece, since she’s a huge bookworm! Pili recently posted…Mark This Book Monday: Ashfall by Mike Mullin!! Exactly, Pili. I think young kids would definitely enjoy this. But for me, obviously as an older reader, I was looking for a little more. A lot happens in this first installment and I was hoping for a bit of narrative marinating…know what I mean? I wanted everything to have been built up just a little more. Still good, though, and I hope your boyfriend’s niece enjoys it.